Discovering something new and delicious can be a real treat! 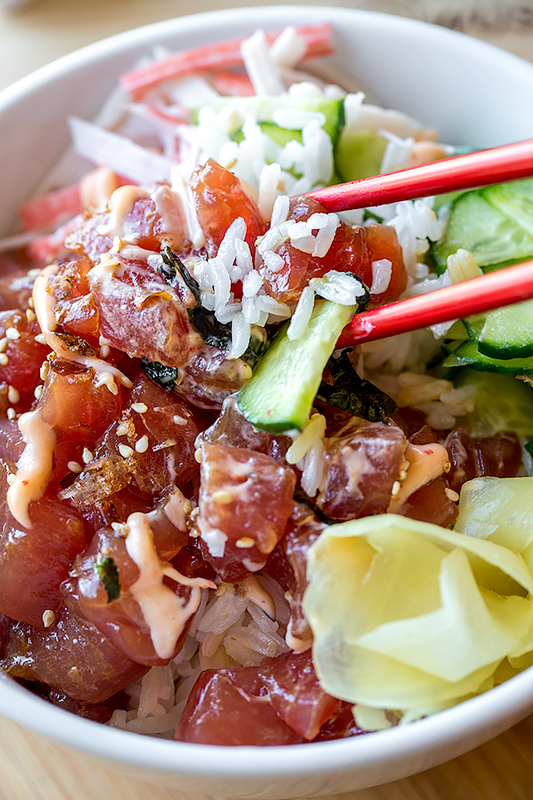 A fresh poke bowl with ahi tuna is our latest find. When my husband and I have a quiet Saturday afternoon to ourselves and feel like exploring, we just love poking around our favorite old-town district that’s located not too far from our home, one that is full of really cool shops and great little places to eat. And sometimes, the alley-ways have the best hidden gems; like the little poki bowl place that my hubs noticed while passing by a couple months ago—he’s been craving it ever since. 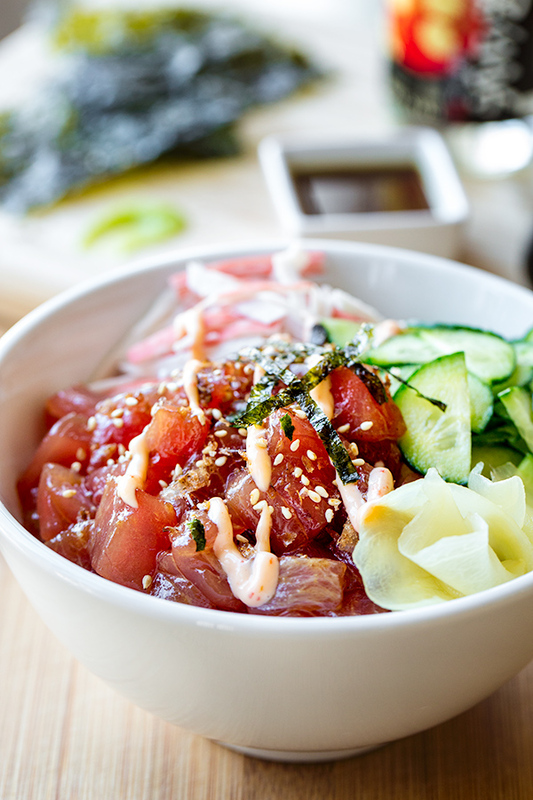 What’s a poke (or poki) bowl, you ask? Well Wikipedia’s explanation is that it’s a raw fish salad served as an appetizer in Hawaii; but I kinda like to think of it as a deconstructed sushi roll, served in a bowl. 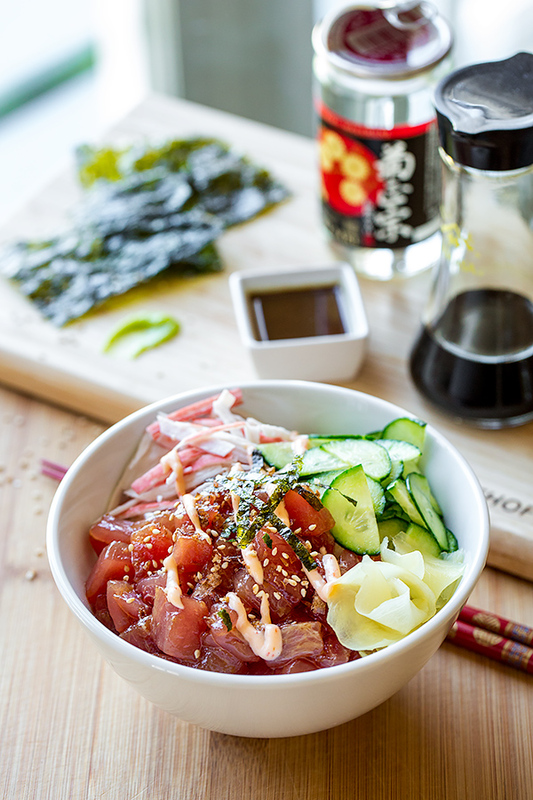 It’s fresh, raw fish (my favorite is either ahi or yellowfin tuna), tossed with a flavorful and zippy sauce (I love spicy wasabi and soy! ), and spooned over your choice of rice along with tasty accoutrements like pickled ginger, wasabi, seaweed, cucumber, etc. So delicious, so healthy and light! 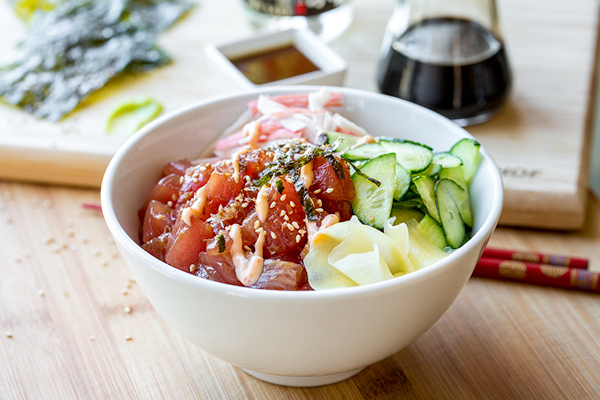 After my husband, my son (who was home for the weekend), and I finally decided to give these poke bowls a try and stuffed ourselves on them, I thought it’d be a fun recipe post to recreate here on The Cozy Apron. It’s for anyone who’s a sushi roll lover who’d perhaps appreciate a simpler and more do-able approach; and for anyone who’d love to try something new and maybe different! To begin with, it’s very important to purchase high-quality, fresh fish for these bowls because, of course, it’s eaten raw. Go to a fish market (I love Whole Foods Market for this type of stuff) and ask for “sushi-grade” ahi (or yellowfin), and use it the day of. This is a recipe that is best eaten immediately (or shortly after it’s prepared), and not kept as leftovers. You don’t need to buy a huge amount of the fish, either. One nice piece of tuna (8oz) can easily feed a couple of people, considering that you’re also adding other delicious goodies into the mix. All I know is that these poke bowls (or “poki” bowls, as you can find it spelled both ways) are all the rage right now in southern California, and while I’m not typically one who really has much interest in what’s “all the rage”, this is one food trend that I can see sticking around a long time, and making it’s way into mainstream notoriety. Colorful, fresh, light and healthy—truly, there’s so much to love about it! 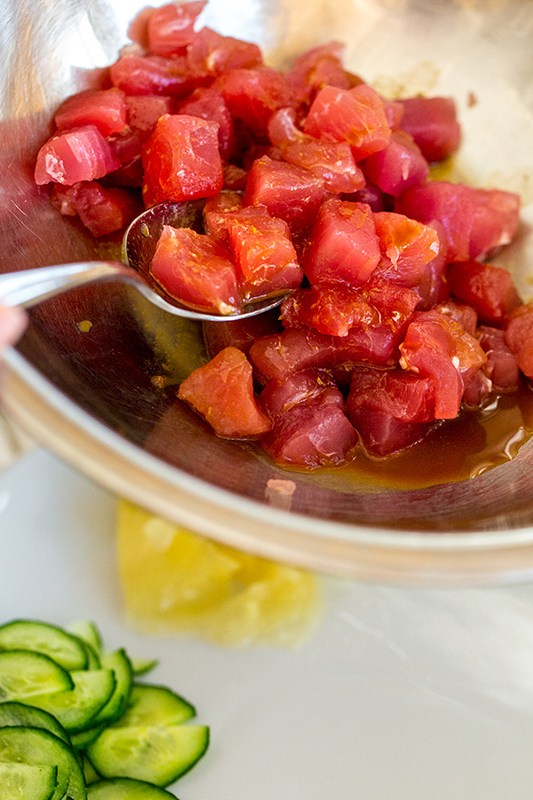 -Add the cubed tuna to a small bowl, and drizzle over about half of the Wasabi-Soy sauce, reserving the rest for dipping, if desired; toss to coat the fish well. 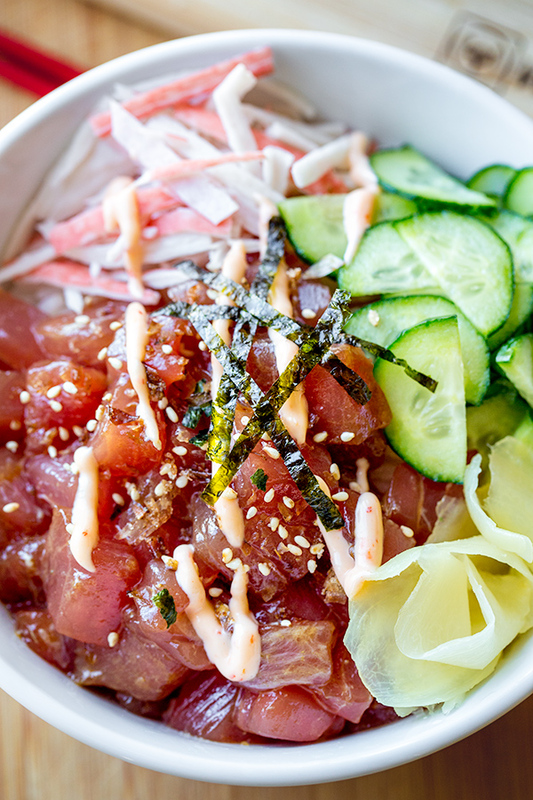 -Spoon equal amounts of the rice into two bowls, then top with equal portions of the seasoned tuna; add the toppings of your choice to each bowl and drizzle some of the Chili Aioli Sauce over top of the tuna; sprinkle over some sesame seeds for garnish, and enjoy. -Place all ingredients into a small dish and whisk together until well-blended; use immediately, or keep in covered container in fridge. -Add ingredients to a small dish and whisk to blend, then spoon into a small ziplock bag and cut the corner off when ready to drizzle the sauce over the fish; keep unused portion in the fridge. Hi Allie, how fun that you’re familiar! And thank you for your kind comments about the photos—my hubby (our photog) always appreciates it! Hi…do you think using fresh albacore tuna would work as well? Hi Sherry, thanks so much—hope you enjoy!